XMLMax opens XML files, regardless of size, with all XML editing functions in a collapsible, searchable treeview. How large XML files are handled. Schema/DTD validation generates a bookmarked list of errors with instant go to in the treeview, even in multi-gigabyte size files. XMLMax Schema validation. A read-only text viewer instantly loads and navigates any size XML or text file. Find out what's new in the current release. 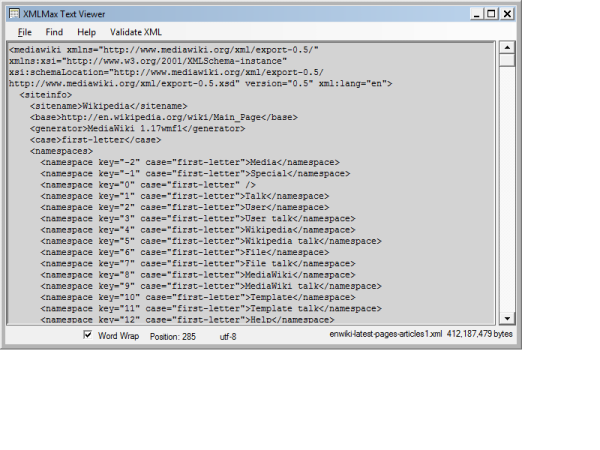 XMLMax was built expressly for editing large XML files. The treeview was engineered to quickly parse and display multi-gigabyte XML files, including ones with a complex or deep hierarchy. Details of its design are discussed in our white paper. When a big file is selected you are never switched to a text view with limited or no XML features and functionality. The treeview uses very little memory, typically about 50 MB, even for very large files, because files are segmented and buffered. It provides a "go anywhere, do anything" editing environment, so you can fix multiple validation errors, make unlimited edits anywhere, search or resume a search, all without having to save the file until you are ready. Plus there is the ability to reload any size file instantly, without having to reparse it, even after editing and saving it, a huge time-saver. Text searching includes global replace and XML-specific options that filter results on node type or an XML path. Check out the XMLMax FAQ. AGM, makers of InterLink, wrote to tell us they used XMLMax with a 270 GB(29 GB compressed) Open Street Map XML file (http://download.geofabrik.de/europe-latest.osm.bz2). So we tried it too, both browsing and saving some edits. Our performance tests show it took twenty-three minutes to fully parse this file and load it into the treeview. A very fast system is recommended for such large files, but only 50 MB available RAM are needed because of XMLMax's file segmenting and buffering. XML files may be validated against an XML Schema or DTD file. Internal and external schemas, schema sets with multiple schemas and schema generation are all supported. Numerous validation options are provided, including the ability to prevent accessing remote schemas. Treeview validation. When the treeview is selected for opening a file, one option allows for validating an XML file while it is parsed and prepared for display in the treeview. This saves time by not having to re-parse the XML after it is in the treeview. Either way, the entire file is validated and all validation errors are shown in a results list that is bookmarked for instant navigation to any of the errors at any time, even after making edits and saving the file. Refer to the online help for more details. Textview validation. 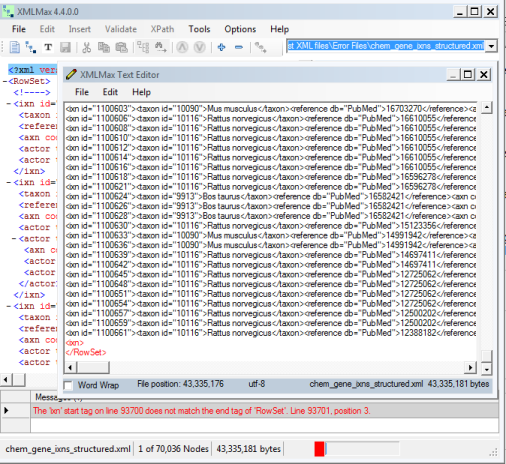 If you do not need to fix the validation errors, the read-only text viewer offers a faster way to perform validation. Time is saved because the text viewer loads instantly and the validating XML parser does not have the overhead of formatting the XML for the treeview. Well-formed XML errors cause any XML compliant parser to stop reading, as required by the W3C XML standard1. Therefore, the XML cannot be edited in a full XML environment until the error is fixed. Such errors mean the file is technically not XML and the only way to fix them is with a text editor. This is how our text editor handles XML errors. 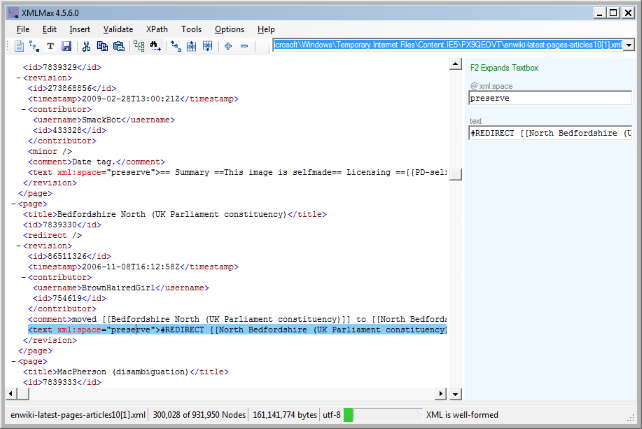 XML parsers report the line number and line position of such errors, but counting lines is slow, especially if the line is deep into a large file. So we developed a way to instantly locate, bookmark and display the error. The result is that once the parser reports an error, there is no delay accessing it in the text editor. You can browse and search the entire file and return to the error at any time, instantly, using the bookmark, to fix and save it when you are ready. If, two line numbers are reported in the error message, both are bookmarked. Refer to the online help for more details on this topic. Also check out our article that explains the difference between schema errors and well-formed errors and the one on XML parsers. Data may be located using either an XPath expression or a text search. Text search includes a replace function. The Text Viewer also provides a text search, but not replace since it is a read-only file viewer. Xpath queries may be executed with results displayed via the treeview or in a list. XPath is supported for XML files for which there is sufficient memory to load the entire file in memory. Refer to the online help for more details on searching. XSL transformations may be run with a user-provided style sheet. XSLT is supported for XML files for which there is sufficient memory to load the entire file in memory. There are more details in the XSLT online help topic. If you do not need to modify large XML files, our read-only text viewer opens any size text or XML file in less than two seconds, including the above referenced 270 GB file, provided it is on a local disk drive. Navigation to any position in the file is just as fast. The viewer provides XML schema validation and a basic text search, both of which are as fast as any XML tool, but the quick loading can save a lot of time. The treeview detects several XML security exploits discussed in our blog article, when a file is opened. XMLMax includes a tool that globally removes or replaces characters not allowed in XML, as per the W3C XML specification. XMLMax can globally convert date and time strings to XML datetime format (ISO 8601), or remove them. This is a free update for customers having version 4.0 or greater. Version 4.5.6.0 consists of new XPATH and related features as well as User Interface improvements. In the XPATH dialog there are two new command buttons: Load From File and Save to File. Using the Load button, the dropdown listbox for entering XPATH expressions may be populated from a file. This adds XPATH expressions in a text file to any existing contents in the list box, up to a maximum of ten. Using the Save button, the contents of the XPATH dropdown box may be saved to a text file. This writes XPATH expressions to a text file, one per line. The main toolbar has a new icon for navigating to the the parent of the currenly selected XML element. Each click of the icon, or its corresponding shortcut keys, navigates to the next parent until the root element is reached. This icon is to the immediate left of two icons for related path operations, navigate to the preceding and next path. Any non-mobile Windows Operating System From XP to the most recent. One gigabyte of random access memory is recommended. Copyright Ⓒ 2008-2018. Xponent LLC. All rights reserved.